In your Reading List, the Insights are by default listed in reverse chronological order (most recent first). You can choose to change the order to “Most Viewed” or “Most Discussed” Insights, by changing the selection in the top left-most drop down list. Both of these options have been built to ensure that you don’t miss out on the top trending Insights in your Insight List. 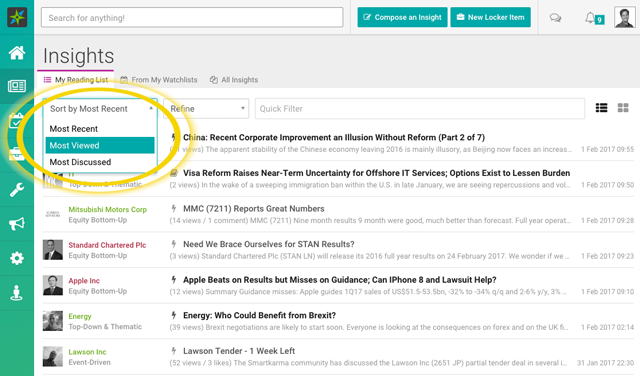 The "Most Viewed" will show you the Insights in your Insight List with the highest number of overall views. The "Most Discussed" will show you the Insights sorted by the number of comments received on the Insight.